What if approaching your dreams as a courtship helped you restore belonging to the split-off parts of yourself? And what if “courting” your dreams could bridge the gap between your authentic Self and who you’ve had to become to survive — so you can return home? According to author, teacher, and dreamworker Toko-pa Turner, tending to the relationship with your dreams is vital to reconnecting you with your deepest knowing — revealing and mending the fractures in your soul. On Saturday, December 15, Toko-pa will share a unique approach to dreamwork that invites you to dance with the mysterious others within you so that you can reconnect with your deepest knowing. Toko-pa’s approach to dreamwork blends the mystical tradition of Sufism, the depth of Jungian psychology, and a feminine receptivity that cherishes dreams as sacred. Regardless of your level of experience with dreamwork, you will be guided to begin a conversation with your soul… forever mysterious, yet your most trustworthy companion as you make your way home. During Courting the Dream, you’ll discover how dreamwork can help restore your wounded instincts, which are actually the seat of your creativity… and help you experience greater freedom and personal power in your daily life. 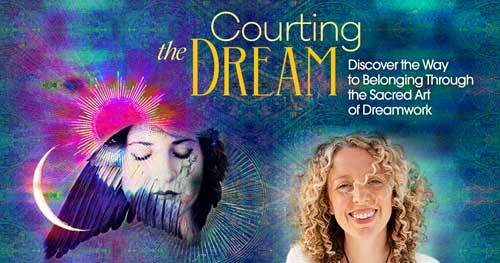 Share the post "Virtual Event: Courting the Dream with Toko-pa Turner"